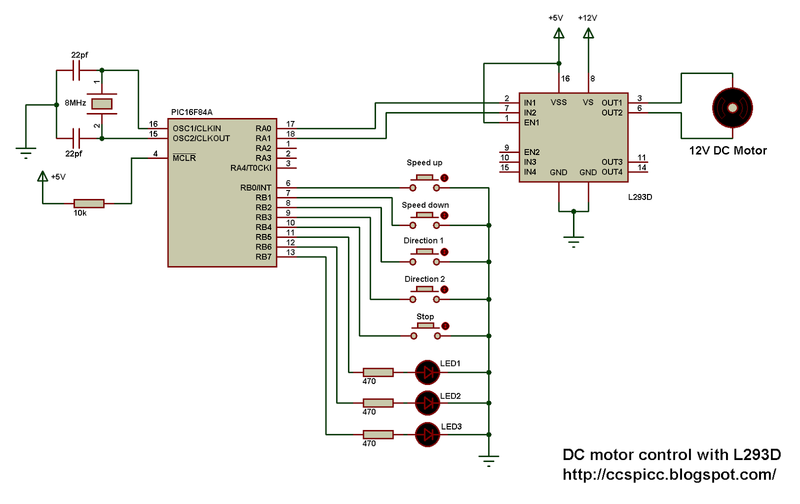 Low power DC motors can be easily controlled with half H-bridge IC L293D. This IC is 16-pin IC which can control 2 motors in both directions. This topic shows how to control DC motor speed and direction with PIC16F84A and L293D motor drive integrated circuit. The following topic shows how to control a DC motor with PIC16F84A and H-bridge circuit. The nominal voltage of the motor is 12V as well as L293D VS input voltage. Always L293D VS voltage is the same as the DC motor voltage and L293D VSS voltage is +5V. In the circuit there are 5 buttons, the first button which is connected to RB0 pin is used to speed up the motor, and speed down button to decrease motor speed. Third and fourth buttons are used to choose direction rotation of the motor (direction 1 or direction 2). The last button stops the motor no matter what speed or direction. There are 3 LEDs, LED1 and LED2 are used to indicate motor direction, and the other LED indicates maximum speed, which means when it is on the motor is running at maximum speed. When speed up button is pressed the PWM duty cycle increases which causes the motor to increase its speed and when the duty cycle = 100 LED 3 turned on. In the other hand if speed down button is pressed the duty cycle decreases and the motor speed also decreases. If the stop button pressed the motor stops and the 3 LEDs are off. Software PWM is used wih frequency of 500Hz. The full C code is shown below. 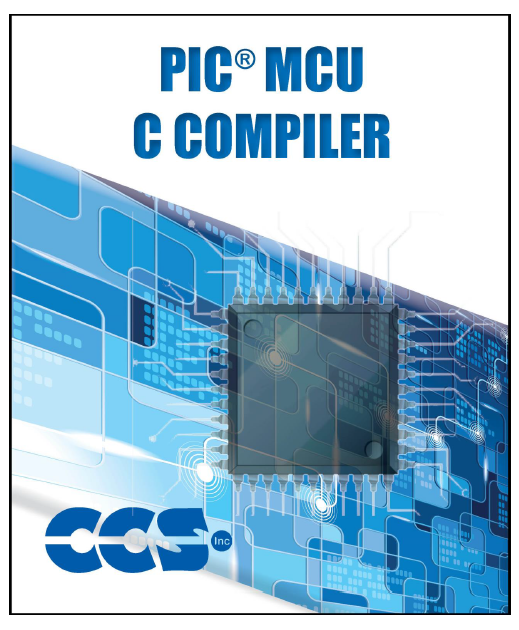 Official software PWM library which comes with CCS PIC C compiler is used, this library uses Timer0 to generate the PWM signal. The following video shows a hardware circuit of the project. The RC-5 protocol was developed by Philips in the late 1980s as a semi-proprietary consumer IR (infrared) remote control communication protocol for consumer electronics. The first 2 bits are start bits and they are always logic 1. The third bit called toggle bit, it can be logic 1 or logic 0. And the last 6 bits are command bits, each button has its command number. For the same device for example TV all the remote control buttons has the same address but each button has its command. The toggle bit changes whenever a button is pressed. This link from Wikipedia has more details about Philips RC5 protocol. 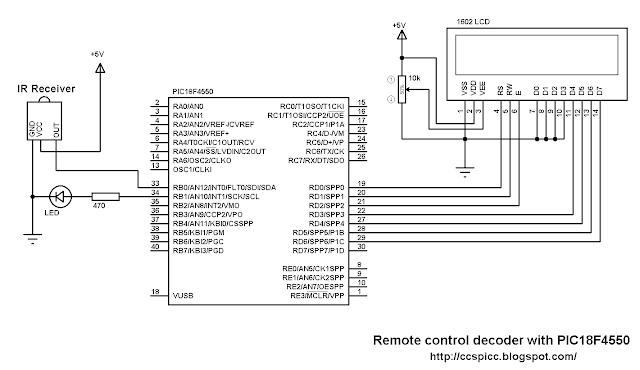 RC5 IR remote control protocol decoder using PIC18F4550 microcontroller: This topic shows how to decode and get RC5 data of a TV remote control uses RC5 protocol with PIC18F4550 microcontroller and CCS PIC C compiler. The project circuit schematic is shown below. The IR receiver is used to receive the IR signals transmitted from the remote control and convert this signals to a digital data (logic 0, logic 1). The microcontroller PIC18F4550 reads digital data from the IR receiver, this data is decoded and the results displayed on 1602 LCD display. The LED which is connected to RB1 pin blinks when RC5 protocol is received. The code is written and compiled with CCS C compiler. I made the code simple as I can, no Timer module and no interrupt are used. The microcontroller waits until the IR receiver receives IR data which means it waits until RB0 pin goes from high to low. The signal is checked every 50us and a variable (count) is used to count number of 50s, for example if count = 5 so the total time before RB0 goes high is 250us. If count >= 20 it means time out and the received signal is high for more than 889us. If count < 14 it means signal high time is lower than 889us. Second bit checking is the same as the first bit checking except that low both 889us are checked. 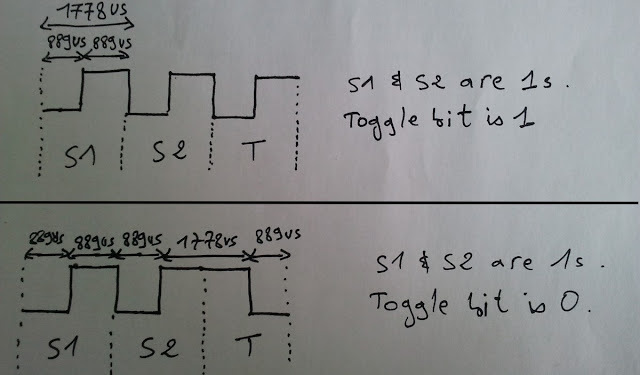 After the 2nd start bit there is toggle bit which is 1 or 0, and if toggle bit is 0 time required for RB0 pin is 1778us which means to start reading bits we have to add a delay about 400us, and if the toggle bit is 1 we have to wait 1200us. The complete RC5 decoder CCS C code is as the following below. The following video shows the project using hardware circuit with some details. 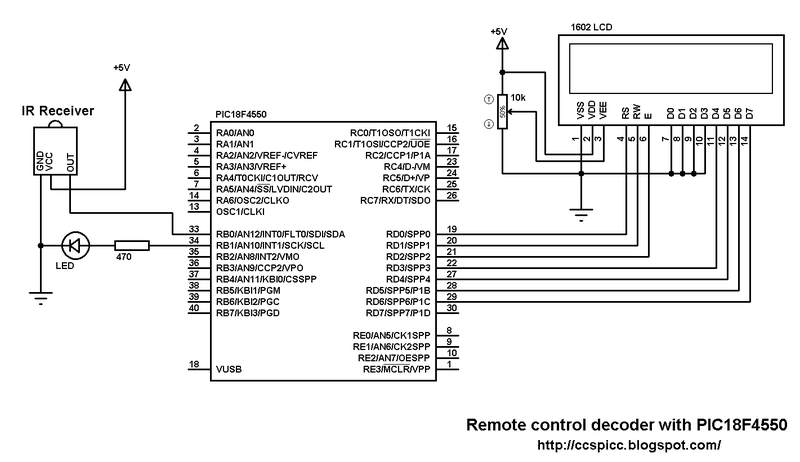 RC5 IR remote control protocol decoder using PIC16F84A microcontroller: This topic shows how to decode and get RC5 data of a TV remote control uses RC5 protocol with PIC16F84A microcontroller and CCS PIC C compiler. The IR receiver is used to receive the IR signals transmitted from the remote control and convert this signals to a digital data (logic 0, logic 1). The microcontroller PIC16F84A reads digital data from the IR receiver, this data is decoded and the results displayed on 1602 LCD display. The LED which is connected to RB1 pin blinks when RC5 protocol is received.